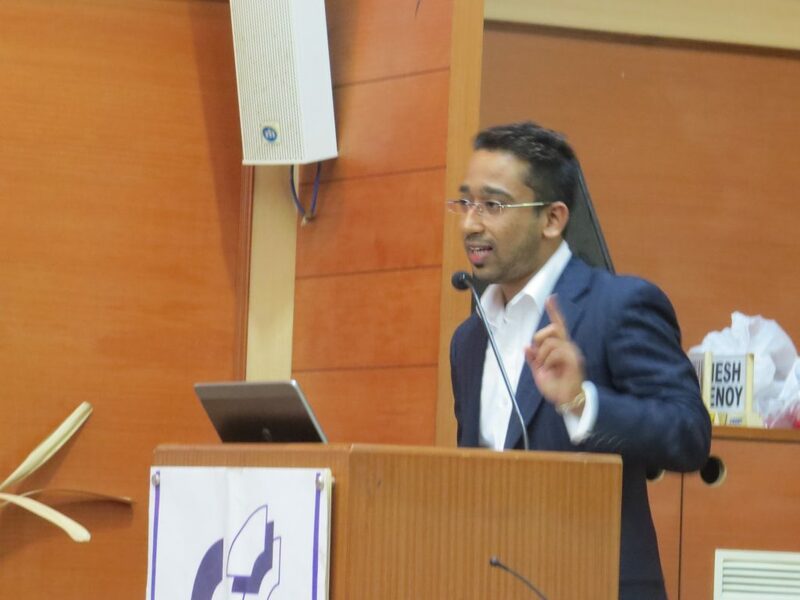 Mr. Ciril Abraham, COO of The Professional Couriers, visited IIM Indore, Mumbai Campus to interact with PGP students on 25th November. Mr Abraham is a post graduate in Masters in Global Business Analysis from Manchester Business School, United Kingdom. After graduation Ciril joined his father’s company as COO to manage the operations vertical. Mr. Abraham shared his experience with logistics and practical knowledge he gained during his course of being COO of the company. He also talked about the growth in logistics industry during the last few decades and how The Professional Couriers leveraged the advantage of being first mover in this industry. The quality of service, economical prices, timely delivery and vast network according to him helped the company to survive in tough times and come up as one of the prominent courier service in the country. Focusing more on logistics services Mr. Abraham explained types of logistics sector, market of courier service and scope of business in this sector. According to him logistics is one of the simplest businesses that one can start as it’s unorganized, requires less investment and is unregulated. However, there are a lot of challenges one would face which include controlling of delivering undesirable packages containing illegal items to labor unions, But at the end he made a point that the best management practice is the panacea to deal with all the challenges. Mr. Abraham also juxtaposed the TPC’s performance with its primary competitors like DTDC and Blue Dart on different parameters like pricing, quality of service, profits, network and volume and explained that where the company is performing well and has benefits and where its competitors are ahead. However, he stressed that social and digital media have eaten a major share of their business but diversifying business in sectors like 3rd party delivery and cash on delivery has helped them maintain their profit levels. In the later part of the interaction he explained in detail the day to day operational activities of the company and how he has to deal with operational breakdowns quickly to promise quality service to its clients. Participants found the session very insightful and getting the first hand knowledge about core operations from the COO helped them in perceiving operations as specialization in a better way.